In Tralee last week for the Rose Festival I noticed a great many beds of roses in full bloom throughout the town, well looked after and flowering freely. Many Irish gardens feature rose bushes in one form or another, and the brightly coloured shrub roses, floribundas and hybrid teas brighten the front gardens of our towns and villages throughout the summer. 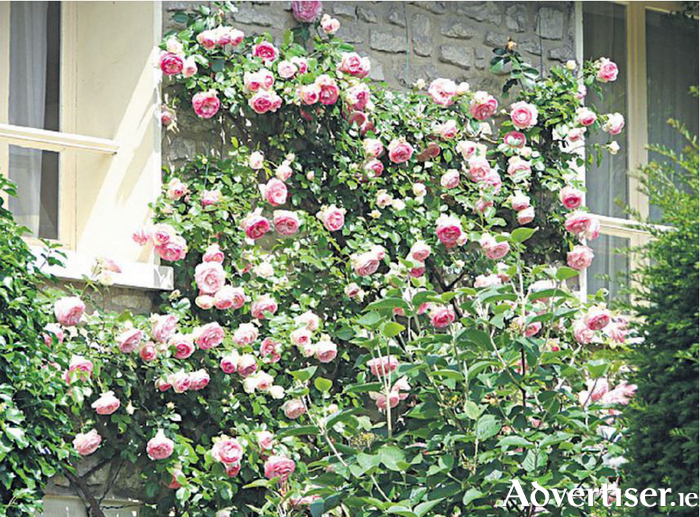 But it’s the climbing and rambling roses that really seem to appeal to the romantics. Many of the clients who call me in to produce garden plans have visions of softly coloured roses tumbling over an archway leading into an idyllic cottage style garden, or gracefully clothing an old stone wall – pretty and nostalgic, it’s an image that’s hard to resist and it’s a great pleasure to help them achieve this. As with so many other things in life, the key to success is in the planning – choosing the right rose varieties for the right spot, and incorporating them into a well designed plan, as well as knowing how to look after them to get the best results. As a rule of thumb, most rambling roses flower in one spectacular flush in early summer, after which they produce new shoots which will flower next year. So if you cut them back in spring, which can be tempting as they do grow very vigorously, you could lose a year’s flowers. It’s better to prune them just after they have finished flowering, which most of them will have done by now, so that you don’t miss out on flowers for next year. Climbing roses, on the other hand, flower on the current season’s growth,so these can be cut back in late winter or early spring. Try and remember to take hardwood cuttings when you do this – it’s a really easy way to produce a whole new plant (I usually think of this after the cuttings have been consigned to the compost heap! ) The most important thing to remember with climbing roses is that you have to spread out the main branches as horizontally as you can, so now in late summer is a good time to do this while the new growth is still relatively pliable. If you don’t train your climbing rose horizontally when it’s young, you will probably find that it shoots straight upwards, leaving several feet of bare thorny stems reminiscent of the Sleeping Beauty’s castle. Gently bend the branches so that they don’t snap at the base and tie in firmly - have your twine or ties ready to prevent the branch springing back. Next spring you will see side shoots emerge along the length of these horizontal branches, and these are the shoots that flower. You might find it impossible to get the main stems horizontal and end up with a kind of fan shape, which is fine – but the more you spread them out, the more they will flower, and each year as new shoots grow you can repeat the process. TIP OF THE WEEK: When pruning any kind of rose, always wear the stoutest leather gloves you can get your hands on – the thorns on older stems are particularly hard and sharp and you want to be well protected if the bush decides to fight back! !